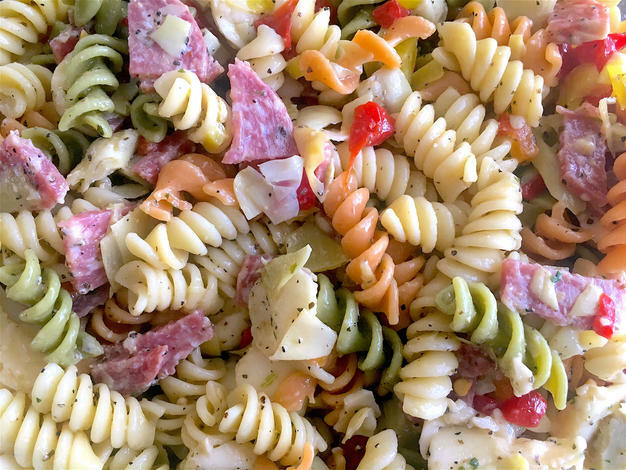 A vibrant make-ahead pasta salad featuring fresh Mozzarella, Sopressata, artichokes and roasted red peppers. Party or no party, I adore a good ol’ antipasto platter any day of the week. Italian ingredients like marinated fresh Mozzarella and salty, piquant Sopressata have my heart. 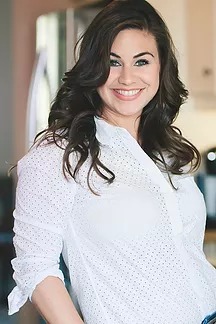 Not only are they full of tasty little bites, but they’re also beyond easy to make as the ingredients are typically store-bought items arranged on a single platter to come together in one big explosion of flavor. As far as I’m concerned there’s only one thing missing from an antipasto platter, and with zero regards of stating the obvious, I’m going to go ahead and say it: Pasta. Okay, okay…I know that’s kind of the point of the whole antipasto thing, but I just couldn’t help myself. And, if you don’t mind me saying so, the pasta kind of brought the whole thing together. Add a little Italian dressing to the mix and I’d say we’ve got ourselves a zinger. 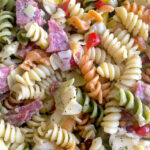 This pasta salad is beyond easy to make, just like the aforementioned platter. Since majority of the ingredients are ready-made, the only work we are truly left with is a tidbit of chopping and the boiling some pasta water. Want to hear about another bonus? Ok, I’ll gladly divulge. In keeping with the original intent of the antipasto platter, it’s divine for entertaining as it can be made in advance and only gets better overnight. I’d say it’s party time. Enjoy. Cook the pasta according to package instructions. Transfer to a colander and run cool water over it until the pasta is no longer steaming. Set aside to drain. In a large mixing bowl, combine the pasta, mozzarella, bell peppers, artichokes, cured meat, pepper rings, parmesan, Italian dressing, pepper and salt. Stir to combine and refrigerate for at least 1 hour or up to overnight to marinate. Serve and enjoy as is, or over a bed of Romaine lettuce.